Vineyard / Origin: Barthenau Vigna San Urbano faithfully reveals the potential inherent in our finest cru to produce world-beating Pinot Noir. It is located in the heart of the vineyard surrounding our Barthenau manor house close to the hamlet of Mazon, where some of the Pinot Noir vines here are over 65 years old. Soil: A mixture of clay, lime, eroded porphyry and fine gravel. Winemaking: The grapes are harvested in small crates to ensure they arrive at the winery completely intact. Most the grapes are de-stemmed and lightly crushed, leaving around 25% whole and unbruised. The berries, whole clusters and juice are allowed to steep at cool temperatures for one day to extract the maximum of varietal aromas. The slow fermentation lasts 10 days at a constant temperature of 28°C, during which period the solid grape parts are kept constantly submerged in the new wine. Maturation: The maturation in oak casks takes place in two phases. The young wine is kept in small oak casks for 14 months, after which a uniform blend is made. The wine is subsequently matured in one large cask for seven months, after which it is filled and matured in bottle for a further year in the cellars of the Barthenau manor house before release. Description: A superb Pinot Noir, whose concentration is clearly heralded by its dark ruby colour. Initially it seems somewhat closed on the nose, but then opens up in the glass to reveal its authentic, noble Pinot Noir origins. The aroma reminiscent of sour cherry and raspberry is enhanced by a delicate hint of vanilla and spice. On the palate it shows excellent harmony with elegant acidity, well-integrated sweet tannins and enormous concentration of aromas. Food Choices: Red meats, venison and game, and mild cheeses. "Wine Spectator" has rated the wine "J. Hofstatter Barthenau Vigna S. Urbano, Trentino-Alto Adige, Italy" the vintage 2011 on 15.10.2015 with 91 of 100 points. "Wine & Spirits Magazine" has rated the wine "J. Hofstatter Barthenau Vigna S. Urbano, Trentino-Alto Adige, Italy" the vintage 2011 on 01.08.2015 with 93 of 100 points. 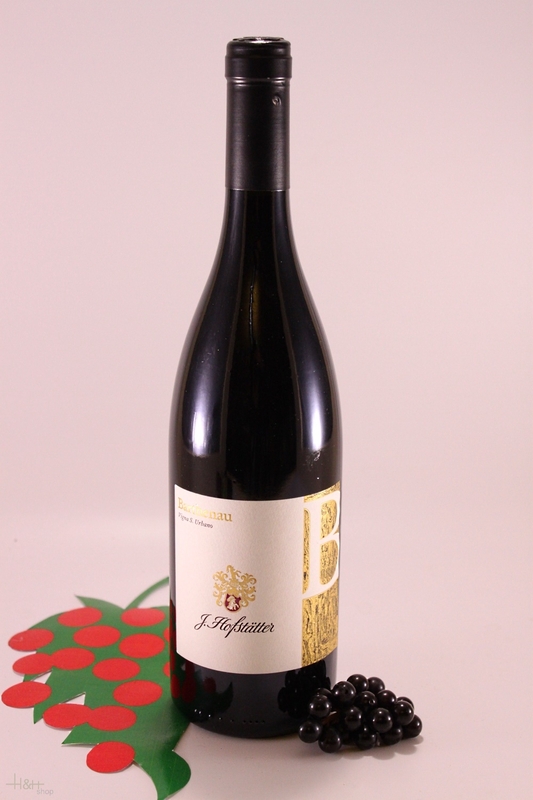 "Falstaff Magazin" has rated the wine "J. Hofstatter Barthenau Vigna S. Urbano, Trentino-Alto Adige, Italy" the vintage 2012 on 23.06.2015 with 94 of 100 points. "Falstaff Magazin" has rated the wine "J. Hofstatter Barthenau Vigna S. Urbano, Trentino-Alto Adige, Italy" the vintage 2011 on 24.06.2014 with 92 of 100 points. "Wine Spectator" has rated the wine "J. Hofstatter Barthenau Vigna S. Urbano, Trentino-Alto Adige, Italy" the vintage 2010 on 31.05.2014 with 90 of 100 points. "Wine Spectator" has rated the wine "J. Hofstatter Barthenau Vigna S. Urbano, Trentino-Alto Adige, Italy" the vintage 2009 on 28.02.2014 with 90 of 100 points. "Wine & Spirits Magazine" has rated the wine "J. Hofstatter Barthenau Vigna S. Urbano, Trentino-Alto Adige, Italy" the vintage 2009 on 01.08.2013 with 90 of 100 points. "Falstaff Magazin" has rated the wine "J. Hofstatter Barthenau Vigna S. Urbano, Trentino-Alto Adige, Italy" the vintage 2010 on 25.06.2013 with 92 of 100 points. "Vinous Antonio Galloni" has rated the wine "J. Hofstatter Barthenau Vigna S. Urbano, Trentino-Alto Adige, Italy" the vintage 2009 on 01.05.2013 with 93 of 100 points. "Wine & Spirits Magazine" has rated the wine "J. Hofstatter Barthenau Vigna S. Urbano, Trentino-Alto Adige, Italy" the vintage 2008 on 01.08.2012 with 91 of 100 points. "Vinous Antonio Galloni" has rated the wine "J. Hofstatter Barthenau Vigna S. Urbano, Trentino-Alto Adige, Italy" the vintage 2007 on 01.02.2011 with 88 of 100 points. "Wine & Spirits Magazine" has rated the wine "J. Hofstatter Barthenau Vigna S. Urbano, Trentino-Alto Adige, Italy" the vintage 2007 on 01.10.2010 with 92 of 100 points. "Vinous Antonio Galloni" has rated the wine "J. Hofstatter Barthenau Vigna S. Urbano, Trentino-Alto Adige, Italy" the vintage 2006 on 01.10.2009 with 92 of 100 points. "Wine & Spirits Magazine" has rated the wine "J. Hofstatter Barthenau Vigna S. Urbano, Trentino-Alto Adige, Italy" the vintage 2005 on 01.08.2009 with 93 of 100 points. "Wine & Spirits Magazine" has rated the wine "J. Hofstatter Barthenau Vigna S. Urbano, Trentino-Alto Adige, Italy" the vintage 2002 on 01.06.2008 with 92 of 100 points. "Vinum Wine Magazine" has rated the wine "J. Hofstatter Barthenau Vigna S. Urbano, Trentino-Alto Adige, Italy" the vintage 2003 on 01.03.2008 with 16 of 20 points. "Vinum Wine Magazine" has rated the wine "J. Hofstatter Barthenau Vigna S. Urbano, Trentino-Alto Adige, Italy" the vintage 2001 on 01.02.2005 with 17 of 20 points. "Vinum Wine Magazine" has rated the wine "J. Hofstatter Barthenau Vigna S. Urbano, Trentino-Alto Adige, Italy" the vintage 2000 on 01.02.2005 with 16 of 20 points. "Wine Spectator" has rated the wine "J. Hofstatter Barthenau Vigna S. Urbano, Trentino-Alto Adige, Italy" the vintage 2000 on 15.09.2003 with 86 of 100 points. "Vinum Wine Magazine" has rated the wine "J. Hofstatter Barthenau Vigna S. Urbano, Trentino-Alto Adige, Italy" the vintage 1999 on 01.01.2003 with 17 of 20 points. "Wine Spectator" has rated the wine "J. Hofstatter Barthenau Vigna S. Urbano, Trentino-Alto Adige, Italy" the vintage 1998 on 30.06.2002 with 89 of 100 points. "Vinum Wine Magazine" has rated the wine "J. Hofstatter Barthenau Vigna S. Urbano, Trentino-Alto Adige, Italy" the vintage 1997 on 01.01.2002 with 17 of 20 points. "Wine Spectator" has rated the wine "J. Hofstatter Barthenau Vigna S. Urbano, Trentino-Alto Adige, Italy" the vintage 1997 on 15.05.2001 with 88 of 100 points.